buyers are online and what they are interested in. Element-360 is an award-winning real estate marketing agency with proven success in a number of markets across a diverse portfolio. The foundation of our business model is based on the Blue Ocean Strategy and its analytical framework. The Blue Ocean Strategy approach is focused on making your competition irrelevant by addressing unmet needs in the marketplace, also known as the ‘Blue Ocean’. We have taken this model and molded it into the digital marketing space for real estate. We have further expanded our foundation through careful studies of how Google operates based on information coming directly from the founders, shareholder meetings and more. We are continually improving our clients’ performance through testing and experimenting. We work with our clients to share results, both positive and negative, in order to adjust to a more effective strategy and become a stronger force in the market. This strategic approach has generated several records and awards for our clients. Element-360 has been recognized as one of the top real estate marketing firms in North America. You can find our work spans over 13 countries including North America, Central America, and the Caribbean. Our team's core strengths are best measured by the quality and quantity of leads generated supported by data analysis, deep insights, and trade secrets. 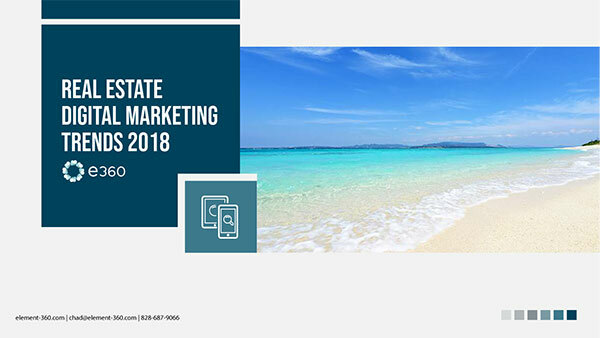 Our team is focused on the real estate sector and has been awarded as one of the top three real estate marketing firms by independent and unaffiliated digital reviewers such as 10BestSEO.com. Since 2009, we have been focused on delivering strong results utilizing cost-effective strategies to reach specific market segments. As we continue to grow and add to our portfolio of successful projects, our goal is to be the #1 real estate marketing firm team in the western hemisphere.